Awhile ago (actually it was before Eleanor was born, so about six weeks ago) I posted an image on Instagram of what I was creating for dinner. Nothing new there, #whatsfordinner could be my middle name. A few people asked for the recipe though and was wondering if it was on my blog, no it wasn’t – but now it is! 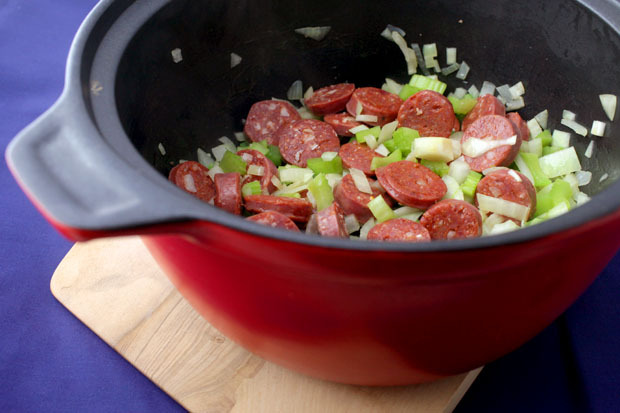 In a heavy based casserole dish/pot (which can go from stovetop to oven), fry your sliced chorizo until a bit of the fat renders out. Remove from heat and set aside in separate bowl. Heat onion until translucent, add in garlic and fry until aromatic. Throw celery in a heat until softened, stirring. 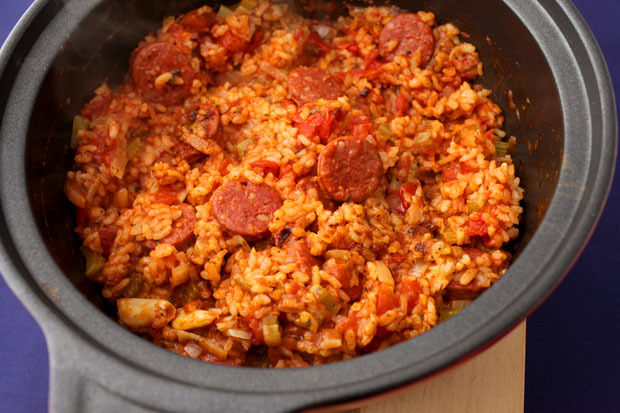 Add chorizo back in and the rice, stir, coating rice in oils from sausage and onion/garlic/celery until rice is slightly translucent. Pour in the stock, then the crushed tomato and paste. Stir to combine but try not to touch it much as more agitation causes the arborio rice to release it’s starches, making your risotto cluggy. Sprinkle dried basil on top and cook in oven at 200 degrees Celsius for 30-35 minutes, or until rice is tender and risotto is at your desired consistency. Serve with crusty bread and handful of fresh parsley. A one pot wonder meal truly is a thing of beauty isn’t it? We got this red casserole dish for our wedding and I don’t know what I did before without it – from stovetop straight into the oven, it’s on high rotation on the kitchen sink to be washed and used again and again. This recipe has been floating about in my mum’s repertoire for many years now, I remember eating it as a risotto loving teenager. I like to whack it together every now and then when I can remember to grab some chorizo at the shops, everything else I’ve generally got in the fridge or pantry. You can omit the celery if you don’t have any, or chuck in some red capsicum if that’s what’s festering in your fridge, truth be told I used a brown onion not red. Some olives would be yum in this, but some fussy tall bloke I happen to live with doesn’t like olives. 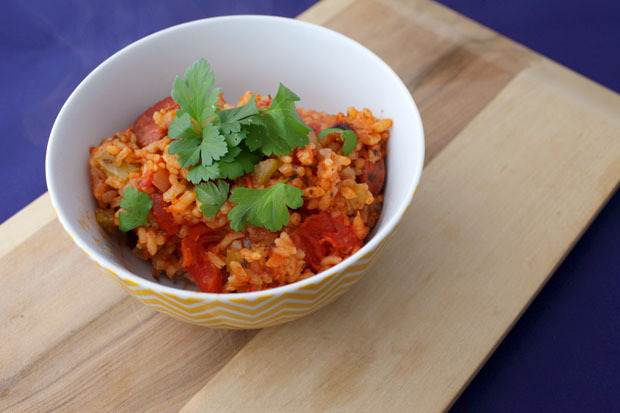 Quick, easy, tasty and gets thumbs up from chorizo loving husband. Winner, winner, one pot dinner! Yum, I’m going to hopefully make this today. 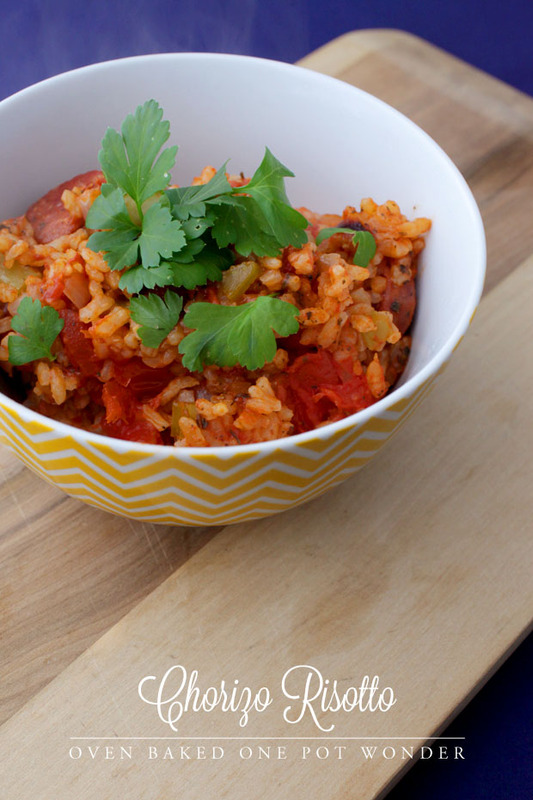 Battling a cold and final weeks of pregnancy + a toddler I need something quick and easy! Aha, I always like new risotto recipes that don’t require a lot of fuss before throwing it all together. Gonna save this one!! Looks yummy, I’m going to try it.